Melissa Etheridge at United Palace Theater July 14 | Errols Weekly Music Update. Roger Waters at Madison Square Garden on Tues. Rocktober 5, Nassau Coliseum on Tues. Rocktober 12 and the Izod Center on Wed. Nov. 3. (performing “The Wall”). Pre-sale tickets available for American Express cardholders beginning on Mon. May 3 at 10:00 a.m. until Sun. May 9 at 10:00 p.m. General public tickets on sale Mon. May 10 at 10:00 a.m. No ticket info on MSG yet; $55 – $250 for the other two venues. Pearl Jam at the Prudential Center on Tues. May 18. Tickets on sale tomorrow at 10:00 a.m. (Live Nation Event). Jackson Browne at The Beacon Theater on Tues. Sept. 14. Tickets on sale this morning at 10:00 a.m. $46 – $155. Also performing at Borgota Event Center in Atlantic City NJ on Sat. & Sun. Sept. 4 & 5. Tickets on sale tomorrow morning at 10:00 a.m. (Live Nation Event). Melissa Etheridge at the United Palace Theater on Wed. July 14. Pre-sale tickets on sale now with the caveat that you have to purchase her new album in addition to the rip off charges that Ticketmaster will force on you (sorry I had to get that out) and that will last until Wed. Apr. 28 at 10:00 p.m. General public tickets on sale Mon. May 3 at noon. $39, $59, $79 and $104. Sting with the Royal Philharmonic Orchestra at PNC Bank Arts Center on Wed. July 7 and at Jones Beach on Tues. July 27. Pre-sale tickets available now until 10:00 p.m. tonight for American Express cardholders. General public on sale Mon. Apr. 26 at 10:00 a.m. PNC: $32.25, $76.25, $106.25 – $232.25;Jones: $43.50-$73.50, $107.50 and $233.50. Erykah Badu at Roseland Ballroom on Tues. May 25. Tickets on sale this morning at 10:00 a.m. $51 – $76. Santana and Steve Winwood at Jones Beach on Sun. July 18 and at PNC Bank Arts Center on Tues. July 20. Pre-sale tickets for Citi card holders will begin next Wed. Apr. 28 at 10:00 a.m until next Fri. Apr. 30 at 10:00 p.m. General public tickets on sale next Sat. May 1 at 10:00 a.m. $25 – $125 for both venues. Rihanna at Jones Beach on Sun. Aug. 15. Pre-sale tickets for Citi card holders will begin next Wed. Apr. 28 at 10:00 a.m until next Fri. Apr. 30 at 10:00 p.m. General public tickets on sale next Sat. May 1 at 10:00 a.m. $32.25 – $107.50. O.A.R. at PNC Bank Arts Center on Fri. Aug. 6. Tickets on sale this morning at 10:00 a.m. $23.75 and $33. 75; Also appearing at the Bethel Woods Center on Sat. Aug. 7. Tickets on sale this morning at 10:00 a.m. $27.80 and $46.15. Creed at PNC Bank Arts Center on Sat. Aug. 21 and at Jones Beach on Tues. Aug. 24. Pre-sale tickets for Citi card holders on until 10:00 p.m. tonight. General public on sale tomorrow morning at 10:00 a.m. PNC: $16.25 and $26.25; Jones: $16 and $26. Tears for Fears at the Hammerstein Ballroom on Thurs. Aug. 19. Tickets on sale this morning at 10:00 a.m. $41.50, $55, $65 and $75. Cheap Trick and Squeeze at Radio City Music Hall on Tues. July 13. Tickets on sale this morning at 9:00 a.m. $39.50 – $99.50. Also appearing at the State Theater in New Brunswick NJ (15 Livingston Avenue) on Sun. July 18. Tickets on sale at 9:00 a.m. this morning. $35, $58, $68 and $75. Little Feat with New Riders of the Purple Sage at the Theater in Westbury NY on Fri. July 30. Tickets on sale Sun. Apr. 25 at 12:30 p.m. $44.50. Hole at the Wellmont Theater on Fri. June 25. Tickets on sale today at noon. $35 ($40 day of show). Foreigner at the Wellmont Theater on Thurs. Aug. 26. Tickets on sale today at noon. $40, $55 and $70. I am totally shocked and saddened by the recent news that Bret Michaels is in critical condition after suffering an apparent brain hemorrhage. I pray that Bret recovers and my thoughts and prayers are with his family & friends. I am at a loss for words. Stunned. “Rush: Beyond the Lighted Stage” will be televised on VH1 and VH1 Classic on Sat. June 26. This documentary on the legendary band known as Rush (a sin that they are not in the Rock and Roll Hall of Fame) will include interviews with Gene Simmons, Kirk Hammett, Billy Corgan and other musicians. Rumor of the week: Alice In Chains will tour this fall with the Deftones and Mastodon. More info supposedly out on Mon. May 3. Another Rumor of the week: After their tour-“Say Goodnight to the Bad Guys”- the Black Crowes will supposedly take a long break or hiatus according to Rolling Stone magazine. The tour ends up in December and Rich Robinson was quoted as saying-“It would be good to have a 30th anniversary but we should walk away from this while everyone is in a good mood.” My guess is that the hiatus will not last as long as their last one. Metallica has been able to keep their European tour going despite the Volcanic Ash that has totally shut down airplane destinations to almost everywhere around the globe. The boys are taking Tour Buses despite the fact that they hadn’t done so since the tragic death of Cliff Burton back in 1986 which was the result of a bus crash while they toured Europe. The band reportedly traveled 28 hours by bus from Oslo to Latvian capital of Riga in what should have been a two hour plane ride. Kirk was quoted as saying that the show must go on but stated that he still fears traveling by bus since the horrible accident 24 years ago. Bon Jovi fans take notice, the band will reissue the first ten studio albums with some live tracks (recorded during the time the albums were out) and probably some “never before released cuts” on Tues. May 10. I believe Bon Jovi has the same manager as Kiss- are you starting to see a pattern between the two bands as far as making more money from its fans? I know I am. I can’t figure out why either Rolling Stone Magazine or Blabbermouth (on line) did not review Slash’s solo album. Both of them totally ignored this super solid debut and I can’t for the life of me understand the reason why? There was not one staff member available to review it? Both of them waited more than a decade for Axl to release his solo album –“Chinese Democracy”-(albeit under the guise of “Guns & Roses”) and painstakingly went through it and if I’m not mistaken Rolling Stone gave it at least 3 stars. I did not want to do this-(meaning the comparison-if you noticed I did not once compare it to Axl when I did my review) but this slight to Slash will not go unnoticed in my book and his solo debut is light years ahead of Axl’s-so much better it ain’t even close. (and they probably used the same amount of musicians to record it even though Slash does not sing). I’m totally confused. I actually watched the show “Glee” for the first time this past week (not for youngsters at all even though it is targeted to them) and I have to tell you I really liked the episode because it focused on the work of Madonna. The entire show was dedicated to the “power” of Madonna and their “re-takes” on her songs were actually very good. Their version of “Express Yourself” is most excellent and I loved the way they performed “4 Minutes”- a total thumbs up and all the cover songs are now available on I-Tunes, check it out. The “American Idol Gives Back” show was solid as always and every one of the cases profiled were heart- breaking to watch and if you can donate what you can afford, it has to help. Here is the link to donate- http://www.americanidol.com/idolgivesback/Personally, I thought Alicia Keys was a bit off, she sounded like she had a cold or something but no disrespect intended because she is a phenomenal talent. The Black Eyed Peas are arguably the hottest act on the planet, they can’t seem to do no wrong. I loved the fact that a legend like Jeff Beck played along side a current star in Josh Stone-she has a spectacular voice. And what else can one say about Carrie Underwood? It is so unbelievable that just a few years ago she was a contestant on the show and now is the biggest star in Country music as she made history last Sunday night by becoming the first female to win “Entertainer of The Year” for the second year in a row. Second year in a row??!! Can you believe that? She is an unbelievable talent who basically freezes me every time she sings and she seems genuine in her respect for the American Idol show. And did I tell you last week that Mary J. Blige did a respectable cover of the Mighty Led Zeppelin song-“Stairway to Heaven”- you saw it for yourself on Wednesday night, she is just way too cool. Again I will stick to the thought that Crystal Bowersox will be this year’s winner. I was not surprised that Tim Urban was voted off this week, he definitely had performed better the last few weeks but he had to go based on who is left. Siobhan Magnus has to be next (to be voted off) but her fans are keeping her alive. “No Anchovies Please”- J. Geils Band– OK so this is really not a song-it’s a narration- one of the strangest stories ever told but I hang on every word and can not turn it off. It is a story of a young couple in Portland Maine where the wife takes out a can of anchovies and as she opens it the weirdness begins. Love the part “…he betrays her to the hands of three scientists who are engaged in diabolical, avant-garde experiments previously performed only on insects and other small, meaningless creatures…” Then it comes to the end where the husband Don screams “Oh my God.. that bowling ball, it’s my wife..” Classic stuff from the“Love Stinks” album. “Be My Girl- -Sally”- The Police– Ok folks you know I do not like to write about such things but there is something about this song that just gets me every time. This is not for the younger ears in your family and to be quite honest I am a little embarrassed to be writing about this track but again there is something very fascinating about it. It’s like the Marx Brothers being very coy as I could picture Groucho and Chico writing about such things, albeit with an “R” rating. I don’t know how this song was approved by the producers or owners of the record company as again it’s really a narration of a very naughty topic. “She Hates Me”- Puddle of Mudd– Again I can’t believe I’m writing about this song as the “F” bombs are present throughout the entire song, along with some other word that describes “crap.” But you know what?-the chorus is so addictive that once you start singing it, you will be singing it all day long. It almost sounds like a country and western song gone bad with the guitar riff that parallel Wes’s “twangy” vocals.This is definitely not for the kiddies, keep them away and please only listen to it in your car by yourself. Yes of course I know the entire song word for word, again embarrassed to say. “Piggies”- The Beatles (well really George Harrison)- I remember the first time my boys (and my wife) heard this song, they all just “squished their eyes” like a bolt of sun had just been “laser-ed” upon them and all of them at the same time said “What is this?” Now admittedly it is obviously a weird topic to write about but the arrangement of this song is actually very good. It actually gets a little “rock and roll” with the part where George sings “…in the lives there is something lacking… what they need is a damn good whacking…” I love the ending when the other join in to help George sing the song and of course the pig noises at the end. “Rocky Racoon”- The Beatles– Staying with the same album and the very next song this is one of my favorite Beatle songs (Ok it did not make my top ten but it is up there). My wife and kids again made faces like they swallowed sour milk and asked about the lyric-“…her name was Magil and she called herself Lil but everyone knew her as Nancy…”- which they said made absolutely no sense. Maybe but that’s what it is. I will never forget I was out with a bunch of fellow “MBIA-er’s” at a local pub in Armonk NY more than a few years back and there was a guy with an acoustic guitar that was taking requests and I asked him to do this song and he obliged. Melissa and her husband Corey both looked at me like I was from a different planet as they had never heard of this song before (what??!!!) while complaining that I had killed the vibe of the night. I couldn’t stop laughing as I sang along word for word. “Hooked on a Feeling”-Blue Swede-I like this version better than the original by B.J. Thomas- don’t ask me why but I even love the “Ouga Chaka Ouga” part which everybody else seems to hate. This song was featured in Quentin Tarantino’s film- “Reservoir Dogs.”Such a great sing along song. “Billy Don’t Be a Hero”- Bo Donaldson & the Heywoods– I am not ashamed to admit that I use to love this song while I was growing up, this was played endlessly on WABC AM radio-yes so the first thing to note is that it was played on AM radio and could I have placed a bigger “L” on my head but you know what- even today I know every word to this song and feel sad at the end of the song when Billy died. Bubble gum music at its best!!! “Until It Sleeps”- Metallica– I know, I know all the original fans of Metallica just passed out and may have crashed their head through their computer right now, so if you know of any you may want to see if they are conscious. Believe me, I know this is not their best work but I did not have such a huge problem with the direction that they took in the late 1990’s. To most of the die-hards this is “pop” and is not even recognized by many of the Tallica brethren. Admittedly I don’t go back to listen to “Load” or “Reload” as often as I do with their earlier albums but every once in a while I pop this open and it still sounds good to me. “Highly Suspicious”- My Morning Jacket– This song polarizes people into two separate groups- the folks that “hate” it and the folks that “love” it-there is no in-between. (talk about that fine line of love/hate, huh?). It sounds like Prince had been stepped on the foot by an elephant because the vocals coming out of the throat of Jim James are really high pitched. Again I will never forget this song on our road trip up to Cape Cod and I threw this CD in and immediately went to this track- at first my boys along with our good friend Angelina did not like the song but it slowly grew on them and became the “song” of the summer that year for us. Now admittedly I am not the biggest Pearl Jam fan there is- that honor belongs to Lisa and her husband, Carmine, as they are the experts on this band and have been part of the fan club for years. My other friend Scott is also a huge PJ fan and he has seen them live many times as well. In addition, it took me some time to get on their band wagon as at first I was resistant to the “Seattle grunge” era that was about to take over the world back in 1991, I was still holding out hope that Poison, Warrant and all those other “hair” bands were going to come out with something that was going to knock everyone’s socks off. Well I couldn’t stop the tidal wave, so I decided to grab a surf board and ride the wave of euphoria known as Pearl Jam. (but I never turned my back on the “hair” bands). For those who know me a long time, you know that I usually resist change, so I was one of the last ones to jump aboard on this whole idea of a CD player and listening to music from a little “flying saucer.” I loved the whole vinyl thing, especially with the big album folders/covers but I had to move along with the rest of the pack, so I finally purchased a CD player and the first CD that I ever bought was “Ten” by Pearl Jam. Another disclosure is that it did take me some time to get use to “Ten”-I know, I know- that is “sac-religious” to say but I have to be honest. Of course I knew “Jeremy” because MTV was playing the video about 25 times a day and slowly but surely I started to get all the hype. And just like when you were a kid at the beach trying to ride the waves in, I finally caught that one wave that took me all the way into the dry sand as the water washed upon the shore. It was easy to get the “hits” like “Evenflow” and “Alive” but I wanted the mysterious sounding songs like “Garden” and “Deep” to sink in so that I could listen to the whole album and it finally clicked. Then I couldn’t wait for “Vs.” to come out and when it hit, I was in “hook, line and sinker.” Eddie and the boys were at one point the band for me, I was absorbed into this band and again couldn’t wait for the next album. And then something happened… I know “Vitalolgy” is loved by many of their die hard fans (and my oldest son absolutely loves this album) but for me, it just didn’t cut it like the first two albums (except for a couple of cuts) and to be quite honest I may have had an overload of Pearl Jam and actually rolled over to Soundgarden. I did not purchase “No Code” and then like 5 years later I was back on board with “Yield” and have followed them since, although again, not the biggest fan out there. 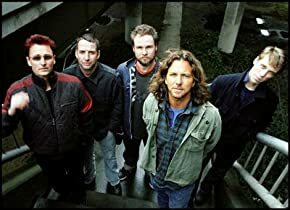 Younger- Once–This song is one of the most played Pearl Jam songs by any grunge fans. It’s a great song and the drumming in this song is so amazing “I could lose myself”. Me- Unemployable– Reminds me of something that the Beatles would do in the 2000 decade. The one constant with Vedder’s lyrics is that they cut to the bone and if you squint from things like that then it’s probably best that you don’t listen to his songs. There are parts of this song that hits home, I’ve been in and out of a job for the past few years and it’s not that I don’t feel unemployable but there are many people out there in this economy that have to relate to this song. “Well his wife and kids asleep but he’s still awake”- I know that has happened to me a few times. Anyway back to the music, this is the “grown up” sound by Pearl Jam that would have never appeared on their earlier albums, whenever this pops up on my I-Pod shuffle I forget how cool this song is and have to rewind it at least once. Younger- Rearviewmirror–-the upbeat guitar and Eddie’s vocals make this song on my top ten because it’s not such a “crazy” song. You can listen to this song with ease. Older- Why Go– Another track from the classic album “Ten” this is probably one of the most aggressive songs on the album.You can just feel Eddie’s pain and anger in his voice that is sometimes more powerful than any instruments playing.I love when Eddie is on the verge of screaming, his voice is so powerful and it’s so thrilling to listen to.My favorite parts are when he yells “Mother! Mother!” throughout the song.It’s awesome! Me- Brain of J.– Now I know that when I did my review of “Yield” (my personal favorite album) I stated that my favorite song on the album was “No Way” but as I went through the 60+ songs in my library, this one kept pushing its way to the top ten. So what gives you ask? Well sometimes my mood changes and the only explanation that I can think of is when I wrote the review for Yield (a year ago today) I was addicted to “No Way.” I still love “No Way” but a year later, “Brain of J.” has jumped a few notches and lands here at number nine for me. These guys had a way of kicking off their albums with explosive songs that get the heart pumping and this one is no different. This is “head-banging” grunge (usually metal, right?) at its best and of course PJ is great at bringing it down and slamming it up again. This is a perfect song for your next Spin class. Younger- Rats- the opening bass and drums make this song great. What’s even better is its awesome guitar solo. You have to give these guys credit for making such good music. Older- My City of Ruins (Eddie Vedder)– This solo cover of a Bruce Springsteen song is done so flawlessly by Mr. Vedder.This song just came out this year and the profits went to Haiti.Sometimes Pearl Jam’s finest moments are when the band lets Eddie take the stage alone with a guitar and his magnificent voice.Vedder sings this song with so much passion when you listen to it you will understand what I’m talking about.This is probably one of Eddie’s best solo performances ever. Me- Yellow Ledbetter– Remember when this song first hit the radio airwaves? It was like the biggest secret because most of the general population couldn’t get their hands on this as it did not make its way onto “Ten.” Now I know folks like Lisa and her husband and also Scott probably had this song because they were “in” with the band-they must have known someone in the band. Supposedly this song is one of the first written by the band members all together and the result is nothing short of spectacular. The bluesy rift is something to behold and you can feel Eddie’s passion bleed through your speakers. The guitar solo is righteous, you can’t go wrong with this track. Younger- Evenflow-Ah one of the greatest grunge songs ever played-“Even Flow.” Next to Nirvana’s “Smells Like Teen Spirit, Even Flow is the next best thing. This song has traveled with me my whole life. What I mean by that is that I’ve listened to this song since I can remember and it never gets old, so all those people who think it’s over played, it’s not. Older- Spin the Black Circle– If you ever want to put on a mindlessly crazy song that makes you jump around just put on this song.This song is just crazy whenever I hear it, it gets me pumped up!“Spin, spin, spin, the black circle! !” Put this in the stereo, blast it, and then just go crazy! Me- Alive-When I saw this performed live at Madison Square Garden in front of like 17,000 fans it was very special and something that I will never forget. Everyone in the whole place was singing it word for word and when I experience things like that I feel very lucky because that feeling doesn’t come along too often. People from all walks of life were smiling, singing and air-guitaring and when Eddie gets to the part where he says “Is something wrong she says.. of course there is… do I deserve to be.. and if so.. who Answered???!! !” well I thought the roof was coming off at the Garden. Of course the guitar solo that takes the song to its end was blazing and everyone at that point was making believe they were playing guitar, a sight to behold. Again if you have never seen them live, you have to see them just to hear this song-unbelievable experience you will feel like you could do anything- yes even fly. Younger- Animal-This song is…is…well it can’t be described how awesome the guitar riff is in this song sometimes I can just listen to the opening guitar lick and that’s it. Older- 04/20/02–This is probably one of the most personal songs Eddie Vedder wrote.It’s about Layne Staley’s death and 4/20 is the day Eddie found out he was dead (Layne had died on April 5th, about two weeks before this day but no one knew).Once again Eddie’s voice is fantastic in this aggressive ballad.Eddie’s voice is sad but the guitar is aggressive and it’s an odd combination but very effective.Every time I hear the opening chords I just stop and listen to this powerful song.The lyrics are phenomenal and the last verse always gets me.Anyone who is lucky enough to find this hidden gem on the “Lost Dogs” album knows what I am talking about. Me- Why Go– Love the way the drums start off this song and no matter what you want to call it-grunge, whatever-this is straight up rock and roll (in my book). The guitar work is flawless (next time you listen to it just follow the guitar and nothing else) and the funky groove is too much for me to take as I have to turn up the volume and repeat this song as many times as I can take it. The musicianship really shines brightly in this track as these guys are super talented and songs like this put them immediately on the map when they first came up through the minors. And what else can you say about Vedder? If I had to pick one song to display his “rock and roll” voice to someone who was unfamiliar with them (can there be someone out there?) then this is the song I would choose. Freaking phenomenal. Younger- Spin the Black Circle-this song is just crazy and out of control. I just wanna take a broom and air guitar to this song and jump all around my room. One word-EPIC. Older- Yellow Ledbetter– I love the intro and outro to this song, I could listen to it all day long.The guitar work in this song is great especially the solo. This is one of their most ambitious songs and it sounds nothing like your average Pearl Jam song which makes it a winner!I love when Eddie says “make me cry” and the guitar solo kicks in.This song shows a much blues influenced side of the band that frankly I like even more than the grunge stuff. Me- Glorified G-First let’s go to the music-how great is the bass line in this song by Mr. Ament? (again just follow his part) The drumming in this song is so “on the mark” and makes me picture kids ripping open their presents on Christmas morning as the paper wrap is flying every where. I think this is one of their best songs where the background vocals really stands out-“…Life comes…I can feel your heart…”Second I love the fact that Eddie takes on the “gun enthusiasts” with his sarcastic lyrics such as “…don’t think… dumb is strength..” or “…feels so manly, when armed…” But of course with me, it is the music and I can listen to the groove in this song all day long, the lyrics are just the icing on the cake. Younger- Go-Just listening to the bass gives you the chills. After I’m done mastering the guitar- I’m going straight to the bass because of this song. Not just the bass, every instrument in this song is perfect and the best way to start an album. Older- Black– This is probably one of the first Pearl Jam songs I really liked.When I first started playing guitar I played the simple chords to this song all the time pretending I was Eddie Vedder.Since I have played this song so many times I know every lyric by heart.I love the bluesy guitar in the background and once again Vedder’s voice towers over everything else.The lyrics are great and when Vedder yells “Why can’t it be me?” I get chills.This is just classic Pearl Jam. Me- Wishlist-For some reason when I hear this song I feel like I am on a boat with an acoustic guitar. Now for those of you who know me you know I have been fishing just once in my life (yes I know I’m “Nordic” and it should be in my blood but it’s not) and that was because I felt guilty that I was the only son that did not spend a day fishing with my dad, so I went and on the calmest day ever-I was immediately sick and spent the whole day in the “bunker” with no hope of seeing land until at least 8 hours. Anyway this song strikes me right at the heart because sometimes I “wish” that I could make an impact on the lives of so many- “I wish I was the evidence, I wish I was the grounds… for 50 million hands upraised and open toward the sky..” The melody is very pleasing to the ear and Eddie’s soft voice can light up a room. The only complaint I have is that the song is over before you know it. Younger- Why Go-probably one of the best Pearl Jam songs ever made. I have most of the Ten album on Rock Band 2. Singing this song is the best felling you’ve ever had, except when you turn around and you see your brother just standing there jumping of the walls. It’s still one of the best and it will be remembered as one of their greatest songs. Older- Better Man– Yes this is a pop song.So what!Although Pearl Jam is famous for their grunge/hard rock sound it is songs like this that I love best.I have played this song a million times and never get tired of it.I also learned the chords to this song and sing it all the time.I love when Eddie screams “She loves him!”I also love the solo performance of this song that’s available on iTunes.This is one of the best songs by Pearl Jam as it shows off their softer side and was so close to being my number one. Me- You’ve Got to Hide Your Love Away-(Vedder solo cover of the Beatles classic)-Ok I know this is a cover and yes I know it’s a cover of the legendary Beatles but his version brings me to a standstill. This song is from one of my all time favorite movies-“I Am Sam”- (with Sean Penn and Michele Pfeiffer) and I remember the first time I heard it while watching the movie-of course I knew it was immediately the voice of Mr. Vedder and dare I say that I like his version better? Can it be true? I’m trying so hard not to say that but his version is pure excellence and again my only complaint is that the song is over before you know it. If this doesn’t move you, then I give up. Younger- Black-This song is the best. There is nothing else that can beat it. This song speaks to me so much. After listening to this song it helped me live and let go. This song has influenced me so much it literally helped me start a new life of mine where I could love myself and do the best that I could do. I know that there is a meaning in life where all of us can share love with everyone we meet- That’s what this song says to me. Older- Nothingman– The first time I heard this song was on a car ride somewhere.I had my iPod on shuffle and was starting to fall asleep but then I this song came up and it was one of those songs that was on my iPod but was never listened to.I sat up and listened very carefully to Eddie Vedder’s flawless vocals.His voice is so perfect for this song you won’t even want to sing along because you want to hear him so badly.As Eddie sings “now into the sun, and into the sun!” while I was looking out the car window I got a special feeling that I’ll always remember.This really is a special song that affected me a lot. Me- Elderly Woman Behind the Counter in a Small Town– Sometimes it is hard to put into words on how you feel about something and with this song I don’t know if I can do it justice (meaning expressing how I feel). When the opening note is sung by Eddie I am immediately put into a trance as I follow along the story line of a couple that once may have dated years ago and the “woman” stayed behind in this little town as he moved on and then revisited one day. Now for me, this brings me back to Brooklyn-so “Brooklyn” is the prior love in this story for me and I moved away back in 1990 and every time I re-visit, the ache in my heart sometimes is overwhelming as I go back in time when I was a child and every thing was seemingly so perfect. Long summer days where we would play stick ball on the streets (“three sewers” was an automatic homerun) totally ignoring the maniacal drivers speeding down the side streets just to get to the next avenue. (are you kidding me? I am so “soft” now due to living in the burbs that when I visit and see kids in the street I have to turn away and go into whomever friends house I am visiting because I can’t take it). Or how about playing “tackle” football on a main avenue (usually “7th Avenue” with traffic going in opposite directions) whenever the first big snowfall would cover the city streets? We “killed” each other and everyone wanted to be on Jay’s side (or Eddie’s side) because we didn’t want to have to tackle him. Or I think back to the days when I worked in “Dan’s Supermarket” and loved every minute of it as I think back to those special friends I had, that I don’t see too often these days. I remember all the girls would run back to their cash register when the local firefighters would come in to shop with each hoping that their line was empty so they could ring them up. Or I am taken back to playing baseball with the Flynn Celtics and I am telling you I played along side some of the best players in the borough-Frankie, Sean, Steve, Ron, Mike, Henry- the list goes on. Or how about the Outlaws football games- “c’mon Cheesy can you throw to someone that has our jersey on??!! !” Running back the kickoff’s with Eddie who was about the same size as me but has the heart of a lion and was totally fearless- he inspired me everyday I played with him. You see what this song does to me? In just a little over three minutes it takes me back to a lifetime of memories- this goes right to the heart. Flawless tune. 2. Mick Jagger (still to this day Carly has never said who the song was about). 3. Has Nirvana sold more records than Pearl Jam? Sadly back on this day in 1975, Peter Ham of Badfinger committed suicide at the young age of 27. He co-wrote the song –“Without You”- which has been covered by many including Mariah Carey. Sadly back on this day in 1991, Johnny Thunders-guitarist for the New York Dolls- passed away at the young age of 38 in New Orleans, foul play was rumored. Back on this day in 1988, while performing in Los Angeles Bruce Springsteen had the entire audience sing Happy Birthday to someone attending his show that night, it was the legendary Roy Orbison. Back on this day in 2003, Pearl Jam purchased a 1,400 square mile of rain forest in Madagascar to offset all the green house gas emissions that came along with their tour that year. Now that is going green before going green set in.